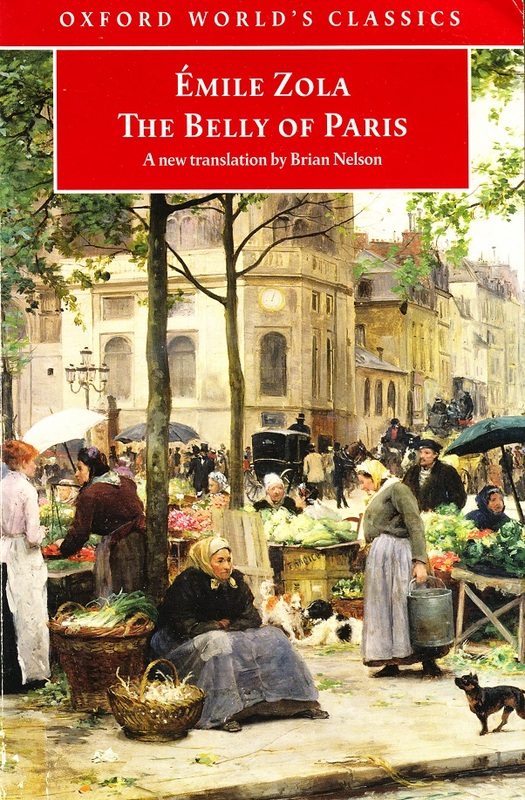 The majority of the novel takes place in the Parisian food market, Les Halles which is ‘the belly of Paris’. This excerpt is from the final page of the book and is an excellent ending to the story, symbolising the defeat of the ‘Thins’ by the respectable ‘Fats’, the petit bourgeois shop keepers. Although it consists of the final few paragraphs, I don’t think reading this excerpt will ruin the book for anyone that hasn’t read it. On his left, La Belle Lisa, looking out from the charcuterie, occupied the entire width of the doorway. Her linen had never been as white as it was now; never had her pink, refreshed complexion been so neatly framed in smooth waves of hair. She exhibited the deep calm of repletion, a massive tranquillity unruffled even by a smile. She was a picture of absolute quietude, of perfect bliss, not only untroubled but lifeless, as she bathed in the warm air. She seemed, in her tightly stretched bodice, to be still digesting the happiness of the day before; her plump hands, lost in the folds of her apron, were not even outstretched to grasp the happiness of the day, for it was sure to fall into them. And the shop window beside her seemed to display the same bliss. It too had recovered; the stuffed tongues lay red and healthy, the hams were once more showing their handsome yellow faces, and the strings of sausages no longer had the sad look that had so upset Quenu. Hearty laughter rang out from the kitchen at the back, accompanied by the joyful rattle of saucepans. Once again the charcuterie exuded health, a kind of greasy health. The great strips of bacon and the sides of pork that hung against the marble brought to the picture the rounded contours of the belly, the belly triumphant, while Lisa, standing there, motionless and imposing, greeted Les Halles with her large, well-fed face. Then both ladies turned to each other. La Belle Madame Lebigre and La Belle Madame Quenu exchanged a friendly greeting.